Churro Donuts, enough said!!! No, but seriously, we took this favorite treat and made it into an even better treat. It’s like all your favorites in one place. Crispy cinnamon sugary outside with a soft pate a choux recipe inside and creamy vanilla whipped cream sandwiched in between. We originally wanted to fill the donuts with the whipped cream, but it was so much prettier to be able to see the bright colors we used and you get two donuts this way. 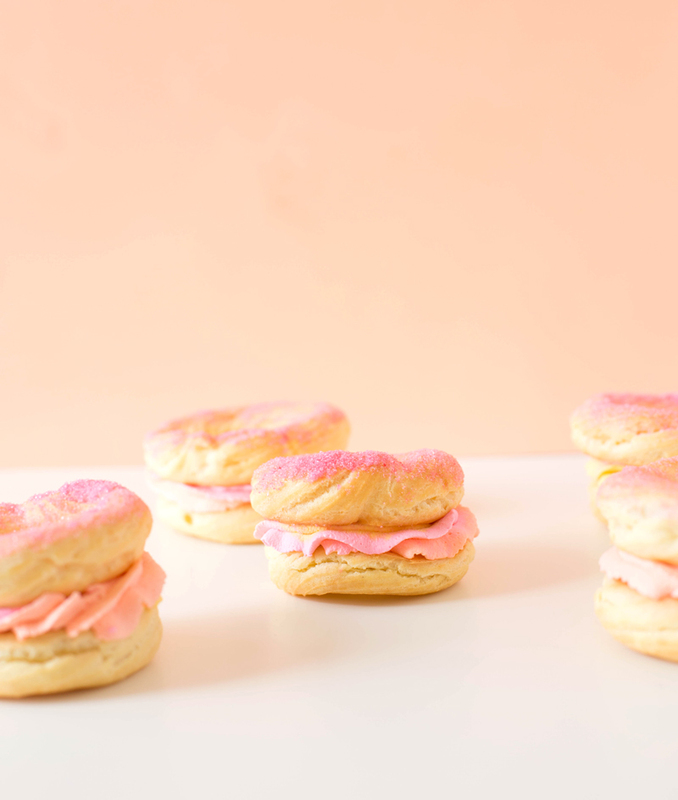 To make the churro donuts you will need to make the donut first, see our crazy easy Pate A Choux recipe for donuts below. Then the sugar sprinkle and the inside filling make for a churro experience you will truly enjoy. Make a batch of these to celebrate Cinco De Mayo, the start of summer or a random Monday… their sweetness will not disappoint. This is seriously the easiest and best churro donuts recipe you could ever learn how to make. Using the pate a choux recipe to create the dough, you can make everything from cream puffs to eclairs, beignets and of course... CHURROS! In a medium saucepan, combine water, butter, sugar, vanilla and salt and bring to a boil. Reduce heat to medium and allow ingredients to combine completely. Once your saucepan ingredients have come together, add all of your flour at once. Quickly stir flour and cinnamon into the butter mixture and remove from heat once you see a film begin to form in your pan. Let mixture cool slightly, then add to the bowl of a stand mixer fitted with the paddle attachment. With mixer on medium, add eggs one at a time. Allow each egg to fully incorporate before adding the next egg. Add your pate a choux dough to your piping bag fitted with the large french tip and pipe donuts on your prepared baking sheet. Bake donuts at 350 degrees for 10-13 minutes. Donuts should be golden on the bottom, light and airy. Color your whipped cream and add to your piping bag fitted with the large star attachment. Brush the tops of your churro donuts with simple syrup and dip in pink sugar. Pipe a ring of whipped cream onto your bottom donut and add the top of the churro donut. Our churro donuts recipe includes a tutorial on how to make Pate A Choux recipe for donuts which is a french way of creating the sweet treat. The recipe creates an incredibly soft and sweet dough that when fried (traditionally), or baked (how we make it) gives that perfect texture of a churro. 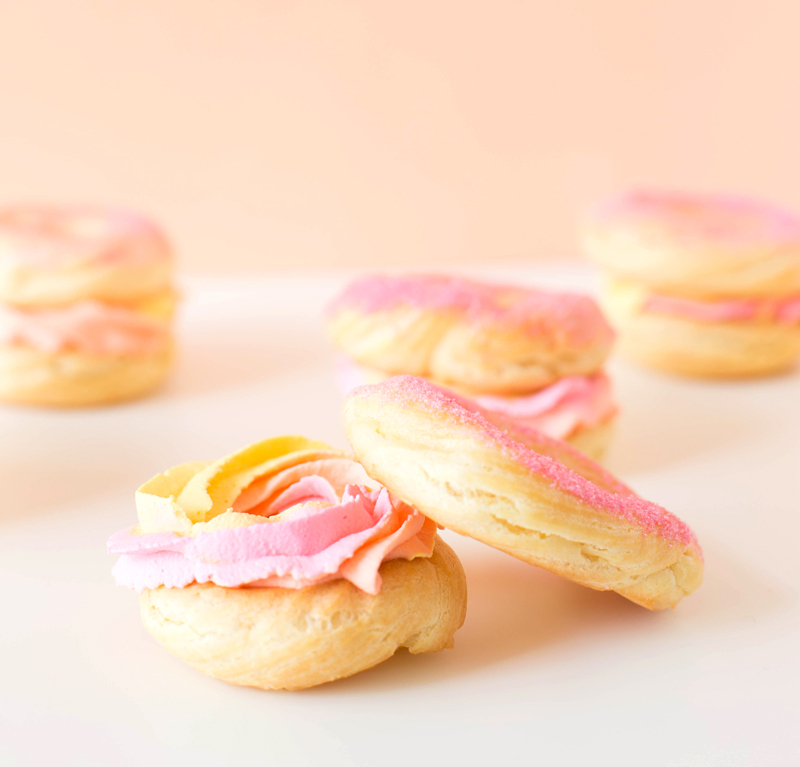 While more traditionally a donut would be thick and consistent throughout, using this pate a choux recipe creates a sweet treat that will be crisp outside and literally melt in your mouth when you take a bite. Learn how to make the French traditional sweet and instantly bring your baking game up like 100 points. Once you’ve created the churro donuts, share + enjoy them with everyone you can find. 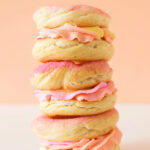 We love this new twist on classic dessert. It reminds me of summer, the state fair and a whole lot of fun. 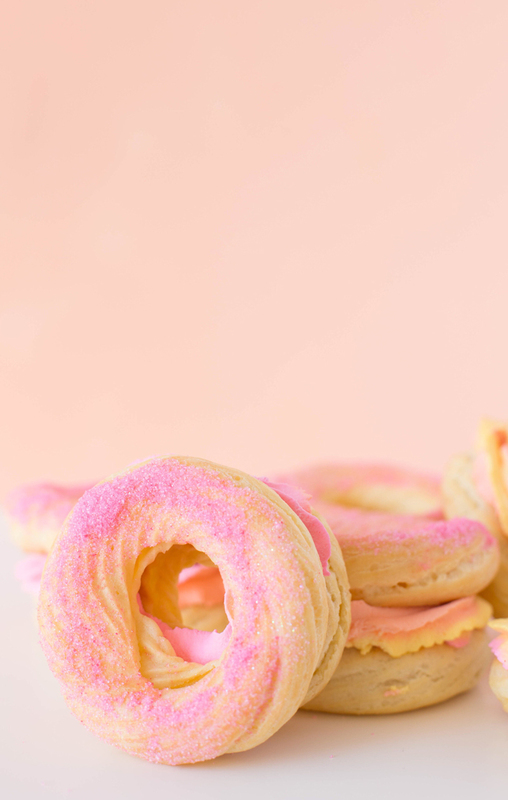 You can make your churro donuts with any flavor whipped cream filling and use whatever color sugar you’d like. 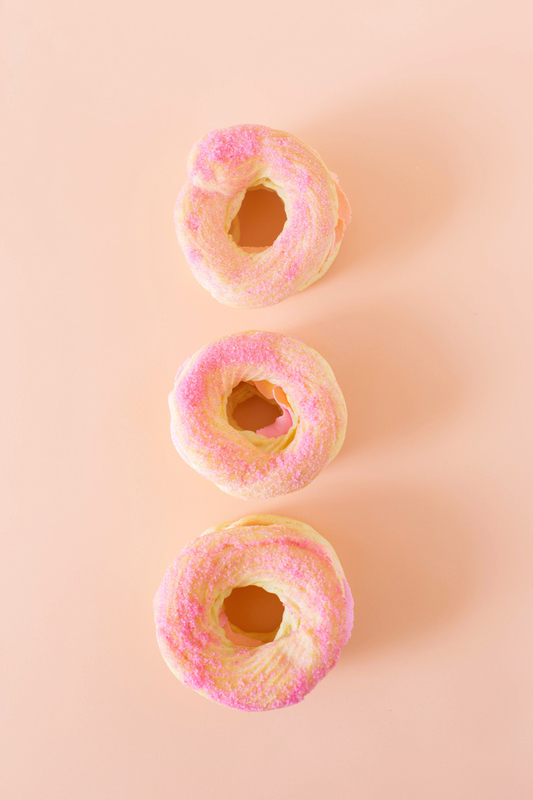 It would be so fun to make a neapolitan box of these cute little churro donuts or you could even come up with your own take of a PB&J, like we did in a cake once! 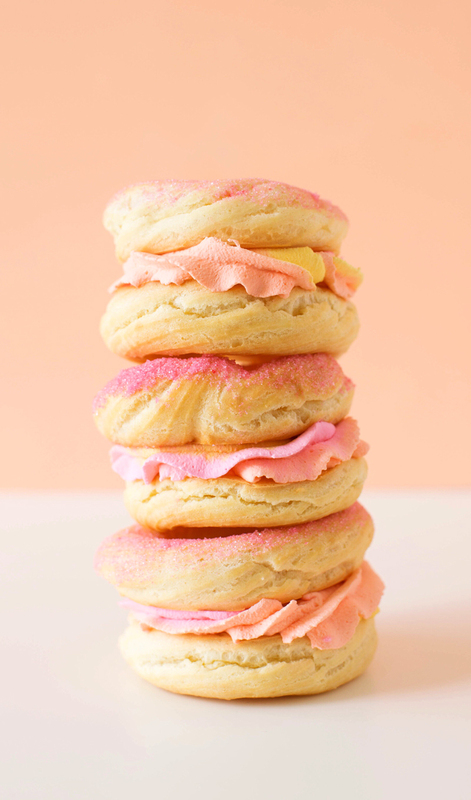 Other tasty donut ideas, because you know we like a donut anyway you want to make it!